One of the major challenges facing scholars seeking to investigate political and ideological developments in contemporary Indonesian public life is the coincidence of two significant phenomena with distinct historical roots: regime change in 1998, and changes to the media technologies by which public life is produced, circulated and sensed. For the most part, scholars of Indonesian politics have sought to negotiate this challenge by treating new media technologies as a neutral factor that has played no role in shaping political and ideological developments. Major studies of contemporary Indonesian politics sketch a continuum on which regime change in 1998 and decentralisation in 2001—but not technological developments—feature as major turning points shaping the contours of public life. In this chapter, I develop an alternative historical framework for analysing the ideological implications of the spread of new media. I argue that we cannot hope to understand the role of technology by positioning the digital in a post-authoritarian frame—the predominant one for analysing political change in contemporary Indonesia. There is little doubt that post-authoritarianism is useful for studying the intricacies of the formal dimensions of Indonesian democracy in the twenty-first century, but it should not be accorded primacy in the study of digital change. When we hitch the study of digital Indonesia to an agenda that seeks to understand emerging forms of political organisation by looking at society through the lens of elections, parties, social movements and states, we forgo the opportunity to use the lens of media technologies. In other words, we forgo the opportunity to understand political change through theories of media change. This chapter draws on such theories to consider how changes in media technologies precipitate political change. It does so by focusing on an important part of digital Indonesia as we know it today: the mobile phone. The vernacular term for a mobile phone in Indonesia is ‘HP’— short for ‘hand phone’. In this chapter I discuss both the historical roots and the social and political implications of the rapid uptake of mobile phones in Indonesia over the last few years. This chapter presents an insider's account of the Indonesian e-commerce industry from 2011 to 2016. Despite several years of impressive growth, the Indonesian digital economy remains in the relatively early stages of inception. This chapter traces the origins of the tech industry from its beginnings in pioneer companies such as KASKUS, Rocket and Go-Jek, through to the now diverse array of start-ups and tech initiatives that are sprouting across the country. It is hard to believe that only a few years ago, few people in Indonesia believed in the prospects of a domestic e-commerce industry. At that time, newly formed technology companies were struggling with the same problems that beset many other industries, causing many in the market to doubt that a robust industry could ever emerge. The ecosystem yearned for the sustenance of stronger physical infrastructure. Ageing, pre-digital logistics companies groaned under the pressure of parcel delivery growth. Powerful banks and a thicket of financial regulations had failed to nourish a simple, user-friendly online payments provider. Slow, labyrinthine bureaucracy complicated the process of establishing companies and of meeting corporate obligations. Financiers looking at these conditions wondered why they should invest in Indonesia. Most struggled to find an affirming answer. Over the period from 2011 to 2016, Indonesia's technology industry blossomed despite these many headwinds. A small number of pre-dominantly non-transactional, information-sharing internet companies were overtaken by a vast ecosystem of operators providing physical and digital wares as diverse as food delivery and bridal services. These new companies navigated and exploited the conditions they found in the archipelago—the ebb and flow of industry regulation, the weaknesses of ancillary industries to support their growth and the shortage of people with the experience to help them chart a successful course through these challenges—and were able to build large, well-financed technology companies that attracted the attention and investments of global financiers. Today, Indonesia's growing digital economy is often touted by econ-omists, entrepreneurs and even President Joko Widodo (Jokowi) as a flagship industry for Indonesia's future economic success. At a stretch, some would even argue that the country has built an internationally relevant technology industry. Several factors provide evidence for this claim. First, Indonesia has its own ‘unicorn’ (a company with a valuation in excess of $1 billion), as confirmed when private equity firm KKR invested $550 million in ride-sharing company Go-Jek in August 2016. Indonesians have welcomed the emergence of new information and com-munication technologies such as the internet and social media platforms. Although internet use remains lower in Indonesia than in the advanced economies, the use of social media platforms has increased significantly. Scholars and observers of social media in Indonesia have pointed out that these platforms have had a positive impact on civil society activism, in particular by widening the civic space that facilitates citizens’ freedom of expression. Nugroho (2011), for example, examined ‘the patterns and processes of collaboration of civil society groups in Indonesia in promoting participatory democracy and freedom of information using new social media and ICTs’ (p. 8), and concluded that ‘the use of the Internet and social media in Indonesian civil society has brought significant implications not only to the organisation's internal managerial performance but more importantly to the external aspects of their work, particularly the dynamics of civic activism and socio-political engagement in the country’ (p. 84). Social media activism has become more prominent over the last few years due in no small part to the famous Prita Mulyasari case, in which a housewife was arrested for making critical comments in an email about her treatment at a private hospital (see Chapter 8 by Postill and Saputro). Based on an analysis of the types of social media campaigns that have attracted the most public support, Lim (2013: 636) suggests that ‘social media activism is more likely to successfully mobilise mass support when its narratives are simple, associated with low risk actions and congruent with dominant meta-narratives, such as nationalism and religiosity’. Focusing on citizens’ participation in the 2012 gubernatorial election in Jakarta, Priyono et al. (2014) argue that social media has become a powerful tool for civic engagement, by which citizens impart information, express opinions, participate in the political process and influence the agenda of the elected government in Jakarta. Tapsell (2014: 217) contends that, despite the big media companies still having the largest social media followings in Indonesia, ‘the emancipatory ability of social media to highlight a significant issue […] is a greater indicator of the power of social media to overcome mainstream media conglomerates’. Gazali (2014: 437) speculates that ‘Should activists keep working […] in the unique realms of social media, Indonesia may keep moving […] towards a so-called “social media democracy”’. Indonesia has one of the largest populations of internet users in the world: 50 million in 2015 according to the Indonesian Internet Service Providers Association (Asosiasi Penyelenggara Jasa Internet Indonesia, or APJII). The number is continuing to grow because most Indonesians are not yet on the internet. Indonesia also has one of the world's largest internet exchanges, OpenIXP. An internet exchange is the physical meeting point ‘at which the networks of Internet Service Providers (ISPs), telecommunications carriers, content providers, webhosters and the like, meet to exchange IP traffic with one another’; the purpose of an internet exchange is ‘to decrease network costs, to improve network performance and to make [networks] more redundant’ (https://ams-ix.net/about/about-ams-ix). Indonesia's exchange connects more than 700 ISPs, content delivery networks (CDNs), government agencies and other service providers and has a peak throughput of 277 gigabits per second. Indonesians are very active mobile phone users. The country has more mobile phones (270 million) than it has people (250 million) because some Indonesians own more than one mobile phone. Indonesians choose their providers on the basis of coverage, or to take advantage of the promotions that are available from time to time. The large number of mobile phone users in Indonesia makes security problems inevitable. Even before the country had developed a high degree of IT expertise, Indonesians were enthusiastically embracing information technology to solve national problems. To create more transparency around elections, for example, the government began to use the internet to relay real-time vote tallies during the presidential elections of 1999. Then, in the 2014 election, a group calling itself Kawal Pemilu (Election Guardians) mobilised large numbers of young, IT-savvy Indonesians to electronically count the results from every polling station in the country, making it more difficult to (for want of a better word) ‘hack’ the election results. The electoral system still relies on paper-based voting, but a bill to allow electronic voting is being considered by parliament. The digital economy has multifaceted, sweeping yet wildly unpredictable effects on society (Eisenmann 2016). In addition to its economic impact, digitalisation can have cascading and transformative impacts on environment, education, health and governance. The digital economy can be defined as ‘the economic activity that results from billions of everyday online connections among people, businesses, devices, data, and processes’; the smooth functioning of the digital economy depends on hyperconnectivity, referring to the ‘growing interconnectedness of people, organisations, and machines that results from the Internet, mobile technology and the internet of things’ (Deloitte n.d.). Inextricably inter-twined with any definition of the digital economy is the notion of the sharing economy, that is, the use of the internet to facilitate peer-to-peer, rather than firm-centred, commercial exchanges (Belk 2014; Hamari, Sjöklint and Ukkonen 2015; Sundararajan 2016). The introduction of new technologies has affected economies and societies many times during the course of human history. What is different about digitalisation is the unprecedented speed of the changes in digital technologies and their widespread impact. To be as well prepared as they can be, countries like Indonesia need to understand what the digital economy is and what the impacts are likely to be. This can help them make informed policy and business decisions that prepare the way for the adoption of technological innovations while safeguarding against the risks. This chapter discusses the potential for the digital economy to generate ‘creative destruction’. First coined by Schumpeter (1934, 1950), this term describes how innovations can revolutionise economic structures by increasing productivity and efficiency, but in the process destroy traditional industries and business models. Creative destruction can be disruptive but it is considered an essential part of economic growth. First, we provide a conceptual framework for the digital economy and look at how digitalisation fundamentally affects economic activity by reducing market frictions and inefficiencies in ways that are not available in the non-digital environment. Second, we review the available data to identify trends in the digital economy in Indonesia. Third, we provide some preliminary estimates of the impact of the digital economy on the overall economy and on productivity, efficiency, inclusiveness and innovation. We also provide examples of how business models are changing, including some that highlight the potential of the digital economy to promote inclusion. 2 - An insider's view of e-governance under Jokowi: political promise or technocratic vision? 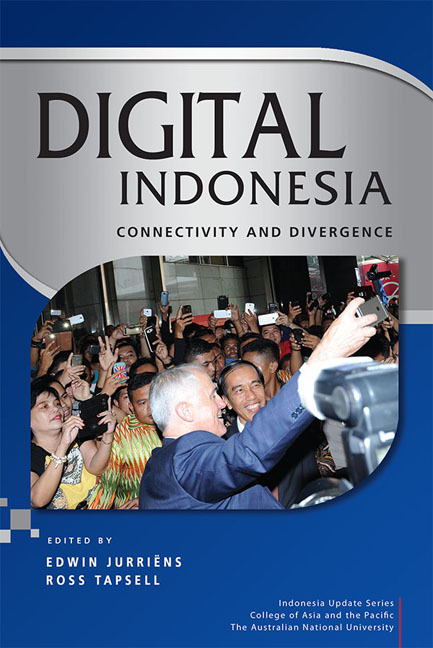 This chapter provides an insider's perspective on some aspects of the digital strategy of the Joko Widodo (Jokowi) administration—both authors hold positions in the Executive Office of the President (Kantor Staf Presiden, or KSP). Among the priorities Jokowi has continuously emphasised is the need to enhance the nation's competitiveness (Ministry of State Secretariat 2014). As he often said during his presidential campaign, one way to achieve this is to make all government services available and accessible online. Another motivation for promising to introduce a full range of electronic services, from e-planning and e-budgeting through to e-catalogue, e-procurement and even e-complaint handling, was to realise the benefits of e-governance for government administration. Jokowi anticipated that the roll-out of electronic government would help to reduce corruption and improve the transparency and accountability of the bureaucracy, in addition to widening the participation of citizens in policy-making (Ministry of State Secretariat 2014). That is, he saw putting government services online as a means not only to deliver better public services and facilitate collaboration, but also to bolster the credibility of his government (Raharjo 2015). E-governance has transformed the way governments deliver services to citizens, increasing the convenience, efficiency and transparency of interactions (Carter and Belanger 2004). The core elements of e-governance are information and communication technology (ICT), organisational change and new skills (Pina, Torres and Acerete 2007). E-governance improves public services and democratic processes and strengthens public support for government programs by increasing the quantity and quality of government interactions with citizens and businesses (Denhardt and Denhardt 2000). This chapter offers a critical perspective on the Jokowi administra-tion's e-governance strategy. It aspires to draw out some of the lessons that have been learned so far: what has worked and what has not; which factors have enabled or constrained implementation; and the strengths and weaknesses in the overarching framework. This is important, because there are always consequences—both intended and unintended—that need to be taken into account when implementing any ambitious government program (Chen et al. 2006). Through an examination of how e-governance is being implemented by the Jokowi administration, we hope to reach an understanding of whether the president's vision is on track to be realised, or will remain in the realm of political promise. Digital technology is fast becoming the core of life, work, culture and identity in Indonesia. In a young nation with a median age of 28 and a rapidly growing urban middle class, Indonesians are using digital technologies in ways that have made the world take notice. In 2016 Indonesia had 76 million Facebook users, the fourth highest number in the world. Jakarta has been named the world's ‘most active city on Twitter’ (Lipman 2012), while other platforms such as Instagram, WhatsApp, LINE, Path and Telegram are all being used in unique and dynamic ways. It is now commonplace to walk into a cafe in one of Indonesia's cities and see a group of young Indonesians all sitting in silence, eyes fixed on their mobile phones. Even outside the cities, there is voracious demand for admittance into the digital world. In research exploring the ‘improbability’ of a nation with over 13,0000 islands, a coastline of 54,000 kilometres and a population of 250 million with dozens of ethnicities, journalist Elisabeth Pisani (2014: 3) observed villagers climbing trees in order to get 2G phone reception; ‘Millions of Indonesians live on $2 a day and are on Facebook’, she wrote. Indonesia's digital economy is an area of great potential, as shown by the rise of Go-Jek and Grab, ride-sharing companies whose success has been propelled by the ubiquitous use of smartphones. In mid-2016 Go-Jek raised $550 million in new capital, giving it a value of $1.3 billion, an incredible result given it had launched its first mobile phone application only a year and a half earlier (Pratama 2016). On the back of Go-Jek and other e-commerce successes, President Joko Widodo (Jokowi) stated that Indonesia aimed to have ‘1,000 technopreneurs’ and a digital economy worth $130 billion by 2020 (Tapsell 2015a; Wisnu 2016). Politically, digital platforms are being used to organise mass rallies, assist with election monitoring and generally provide a space for greater freedom of opinion and expression on a variety of issues, contributing in no small way to the country's rambunctious democracy. Anyone running for political office must now consider how to engage with the world of online campaigning, in particular by nurturing a presence on social media. As this book explains, digital technologies have had a marked impact on the media industry, governance, commerce, informal sector employment, city planning, disaster relief, health, education, religion, artistic and cultural expression, and much more. This book places Indonesia at the forefront of the global debate about the impact of "disruptive" digital technologies. Digital technology is fast becoming the core of life, work, culture and identity. Yet, while the number of Indonesians using the Internet has followed the upward global trend, some groups - the poor, the elderly, women, the less well-educated, people living in remote communities - are disadvantaged. This interdisciplinary collection of essays by leading researchers and scholars, as well as e-governance and e-commerce insiders, examines the impact of digitalisation on the media industry, governance, commerce, informal sector employment, education, cybercrime, terrorism, religion, artistic and cultural expression, and much more. It presents groundbreaking analysis of the impact of digitalisation in one of the world's most diverse, geographically vast nations. In weighing arguments about the opportunities and challenges presented by digitalisation, it puts the very idea of a technological "revolution" into critical perspective. This chapter presents an overview of the digitalisation of knowledge, specifically in relation to education, libraries and archives in Indonesia. After providing background on the broader academic field to which this study relates, I demonstrate how the tropical, humid climatic conditions of the archipelago, and the historical contexts of colonial and autocratic regimes, have affected libraries and archives in Indonesia. My main theoretical and empirical focus is on the digitalising of knowledge, which started around the turn of the twenty-first century. I analyse not only the library and information science (LIS) profession in the higher education and government sectors, but also initiatives involving open-source mate-rials, the visual arts and music, among others. I conclude by highlighting various historical precedents and arguing for more socio-political analysis of the construction of knowledge in both conventional and digitalised libraries and archives. I also have to mention my own position and limitations: while I have a longstanding interest in the field, I have never undergone any formal training in LIS. My encounters, instead, have been facilitated by my position as the founder of an independent library in 2008, which put me in contact with various interlocutors involved in archiving processes both within and outside the LIS profession. LIS, and technical systems in general, requires very careful attention to mechanisms and precise detail. In Indonesia, the ‘great divide’ (Bowker et al. 1997) between social sciences and cultural studies on the one hand, and LIS and the analysis of technical systems on the other, remains wide. Readers interested in more in-depth discussions of education, libraries and archives in Indonesia are therefore encouraged to follow up on the relevant references included in this article. Over the past two decades, the ways in which we acquire, access, exchange and interact with information have changed dramatically. All over the world, the ubiquitous growth of digital technologies has brought massive changes to the ways information is collected, stored and accessed. The new technologies have had a significant impact on the traditional gatekeepers of information storage and access, such as educational institutions, libraries and archives. The rise of digital technology has also triggered numerous academic and popular publications on the future of learning (Davidson and Goldberg 2009), the changing functions of libraries (Lankes 2012: Palfrey 2015) and the role of archiving in the digital age (Herr-Stephenson et al. 2011; Xing et al. 2011). Worldwide, debate is raging over the growth of app-based transport ser-vices as companies like Uber transform the way transport is provided and how consumers access it (Isaac 2014; Aloisi 2015). Often referred to as ‘ride-sharing’ or ‘peer-to-peer’ services, these companies connect passengers with drivers typically not formally registered for taxi work or car hire services through a smartphone app. Passengers pay a set rate, determined by the company, from which a percentage is deducted before the driver receives the rest. Like other large countries in Southeast Asia, Indonesia has enthusiastically embraced app-based transport services. Indeed, Indonesian consumers have adopted app-based transport services with alacrity, hailing cars, motorcycle taxis (ojek) or even the noisy three-wheel vehicles known as bajaj with just a few taps on their phones. The proliferation of what is known locally as ‘online transport’ (transportasi online) has benefited from commuters’ increasing frustration with traffic congestion and poor public transport, as well as the growing use of smartphones. One of the most popular app-based transport services operating in Indonesia is Go-Jek, a locally owned venture whose drivers’ signature green helmets and jackets can be seen on the streets of most major cities across the archipelago.1 Such has been the rise of Go-Jek that it is not so much a form of transport as a phenomenon. As one journalist observed, ‘school children, university students, office workers, even the governor of Jakarta … everyone is talking about Go-Jek’ (Kompas, 18 June 2015). Even President Joko Widodo (Jokowi) is on record as a strong supporter of Go-Jek, having invited its chief executive officer to accompany him to the United States to sell Indonesia's digital potential (Tribun News, 22 October 2015). Jokowi's confidence proved to be justified, with Go-Jek raising $550 million in new capital in 2016 (Digital News Asia, 5 August 2016). The introduction of this ‘disruptive technology’ by Go-Jek and others has not, however, been without its challenges.2 Indonesian consumers may have embraced it, but there has been fierce resistance to Go-Jek and other app-based transport services from conventional transport providers, who have pressured authorities to rein in online providers.